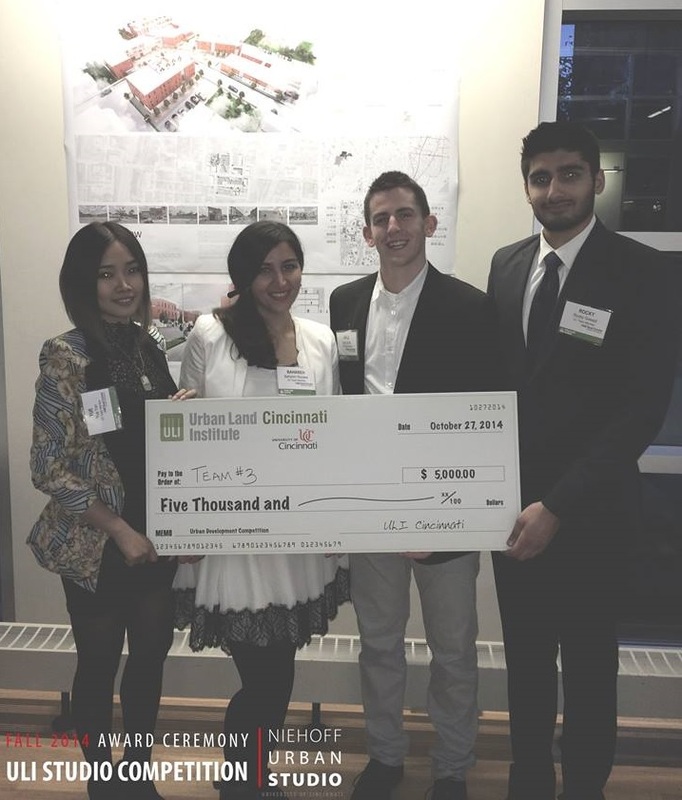 In an effort to reach a younger audience and provide real life experiences to students and future professionals of the construction and development industry, the Urban Land Institute Cincinnati Chapter collaborated with the University of Cincinnati in a local competition that offered a $5,000 prize to a winning design for infill development proposals for the Walnut Hills neighborhood. The competition was modeled after the ULI Hines National Competition, which calls for unique interdisciplinary work among student teams from throughout the country for feasible urban development concepts. The Cincinnati competition, however, went one step further by including a mentoring program, in which local professionals worked directly with student teams over an eight-week period in September and October. The 17 participating students came from the University of Cincinnati’s schools of Architecture, Urban Planning and Real Estate. The participants were divided into four teams, each with assigned ULI professional mentors well recognized for their achievements in their respective fields. Weekly lectures were also provided by professionals in local real estate, architecture and urban planning and design offices in order to expose the students to case studies and useful tools commonly used in professional practice. In an effort to diversify academic participation, the Niehoff Urban Studio once again collaborated with the Lindner College of Business Real Estate Center and the University’s ProPel program to organize the course. Additional participation and assistance was provided by the Walnut Hills Redevelopment Foundation acting as the chief client, while BHDP Architecture established the competition brief. The work culminated on Monday, October 27 at the ULI Studio Competition Reception and Award Ceremony at the Niehoff Urban Studio’s Community Design Center in Corryville. During this closing event, each team was given 40 minutes to make the case for their proposal and field questions from eight-member judging committee comprised of Brian Copfer (CORE Resources, Inc.); Traci Boeing (WesBanco Bank); Jeanne Schroer (Catalytic Development Funding Corporation of Northern Kentucky); Eric J. Gardner, MAI, CCIM (Pillar Valuation Group, Inc.); Graham Kalbli, AIA, AICP, LEED AP (New Republic); Kevin Wright (Walnut Hills Re-development Foundation); Jeff Raser, AIA, LEED-AP (Glaserworks); and Craig Gossman (Gossman Group). The winning team, which included Kyle Zook (SAID-DAAP), Bahareh Rezaee (SOP-DAAP), Yue Yan (SOP-DAAP) and Rocky Grewal (Finance-College of Business), was awarded the competition’s $5,000 prize. Although diverse in nature, the competing designs responded to existing form based code guidelines, the historic neighborhood context, and a mixed-use program brief which called for the incorporation of residential, live/work and retail uses. The winning team’s design set itself apart, however, by using the concept of continuity to aggregate the mixed-use program and buildings around a central public space. Called Firehouse Row, the winning design addressed three blocks of McMillan Street near the center of Walnut Hills. The location is well-suited for infill since each lot is primarily vacant and surrounded by neighborhood residences. “The design for a mixed use development on the site was comprised of a variety of methodologies intended to create a relationship with the surrounding public and implement a notion of connectivity not only within the building but also spanning across the different blocks,” the winning team explained. While primarily an academic exercise focused on the experience of working in a professional setting, the competition aimed to better prepare students in urban development fields to respond to real world situations and work environments. It also provides leaders in the increasingly hot neighborhood with a vision for how the area could be developed. EDITORIAL NOTE: Ana Gisele Ozaki, who has worked at the Niehoff Urban Studio’s Community Design Center as an adjunct professor following her graduation from DAAP’s Masters of Community Planning program in 2013, was the author of this story. Due to a system error, an earlier version incorrectly attributed it to Randy Simes.